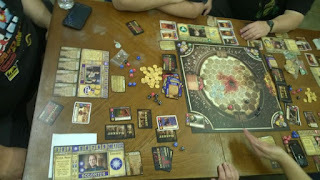 To call it by it's full title, Spartacus: A Game of Blood & Treachery (2012) is a game that sees the table fairly often around these parts. My buddy Norm has it along with all of the expansions as well as promo cards. 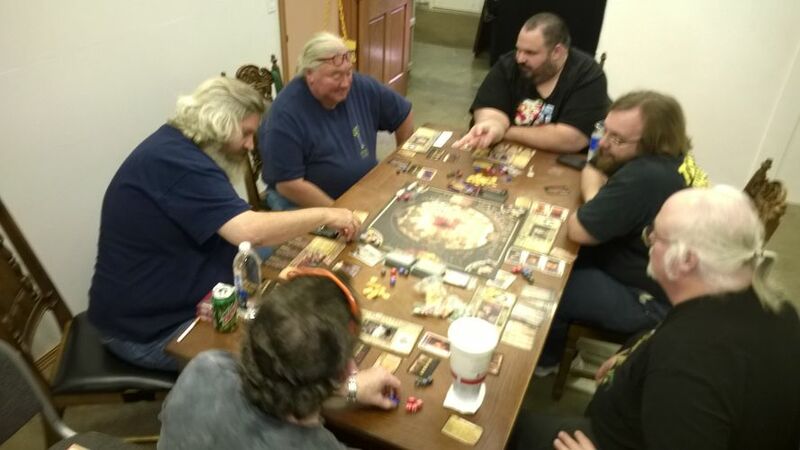 With the new gaming area open as of June, we managed to put together a six-player game to break in the new space including local gaming legend Ernie Gygax. (Dennis was kind enough to share his Onitama game with us, too, but more on that tomorrow in a Systems Saturday post!) It was a good way for Thursday Open Boardgaming to begin at Lake Geneva Games. 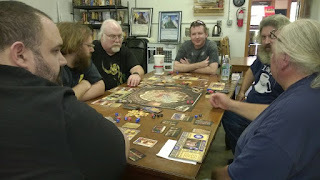 The next one is scheduled for Thursday, June 9th, (Facebook event HERE) and Nancy Hutchins will be there running Demos of Marvel Munchkin. In Spartacus: A Game of Blood & Treachery, an exciting game of twisted schemes and bloody combats inspired by the hit STARZ Original series, each player takes on the role of Dominus, head of a rising house in the ancient Roman city of Capua. Each house is competing for Influence to gain the favor of Rome. Through a combination of political schemes and glorious battles on the arena sands your house will rise in fame and stature. As Dominus, you have a variety of resources at your disposal. Guards protect you from schemes launched by rivals. Slaves run your household and earn gold. Gladiators compete to bring glory to themselves and influence to their Dominus. As always with this game, there was a ton of laughter over the double-dealings and backstabbings that took place. There were quite a few decapitations and a lot more money wagered and won than in many other times this was played, so prices were high for gladiators, guards, equipment, and such. In the end, it came down to a quick move by Paul Haynie discarding guards as per his Dominus ability to close the game down. Well played by all!